A quick post (I’ve been putting it off for too long!) to share some observations, learnings and reflections from recently facilitating the Stanford Institute of Design‘s (the d.school) ‘gift-giving project‘ with a group of colleagues in the Australian Public Service. I think that this session provides a fantastic, fun taster of what design thinking is all about and why building empathy, prototyping, seeking feedback and iterating are critical to reaching good design outcomes. But perhaps more importantly what I love about this course is that it helps people to uncover (or discover?) their own creative potential. People walk into the course thinking ‘I’m not a designer’, ‘I can’t draw’, ‘I’m not creative’, but through the course they do design, draw and generate creative solutions. The d.school make it super easy for facilitators by providing them with pretty much all of the materials you need for the course – facilitator guide, participant worksheets, and post-course handouts (which you can download and use for free under the CC BY-NC-SA licence here) . Note – the recently released virtual crash course makes it even easier as they effectively provide the facilitator too! Prototyping materials. 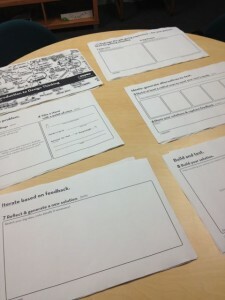 Along with the printouts of the facilitator guide & participant handout, the only other materials that the facilitator needs to organise are the prototyping materials. I did this fairly simply, cheaply and easily – I raided the stationary cupboard and my own drawers at home to find things like: scraps of wrapping paper, foil, rubber bands, coloured paper, old coloured manila folders, plus plenty of recycled packaging materials (toilet rolls, cardboard boxes, egg cartons etc). 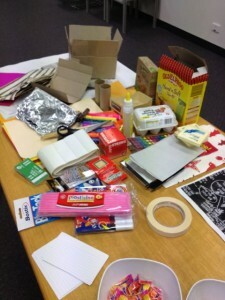 I also took plenty of coloured textas, glue sticks, blue-tak, plasticine and paperclips. Basically – whatever I could easily find. If I’d had more time, I would have been keen to add things like pipe-cleaners and other craft type supplies (I tried Officeworks, but they didn’t seem to stock these materials. A colleague later suggested Lincraft or Hot Dollar type stores which I’ll try next time). Printing the participant handouts. Make sure you select the ‘collate’ option on the photocopier when printing out the participant guides! I ended up spending quite a bit of time manually collating the print outs ’cause I failed to do this (why collate isn’t the default option on all printers/photocopiers baffles me). Music/timer. While the course recommends that you display a timer and play music, we didn’t have access to a projector/speakers (plus there was a large formal meeting happening in the room next door so we tried to keep the noise levels down). I just kept time using the stopwatch on my iPhone and it worked fine for our small group. Group size. There were 9 people in the group, which was a really good size for running through the course for the first time. I’d definitely recommend that first time facilitators try out the course with a group of 8-12. The odd number of participants wasn’t ideal – in the end we had a group of three (which didn’t work perfectly but still gave everyone a taste of the design experience) and I juggled timeframes and instructions slightly to try to make it work. This is why a co-facilitator (or some floating ‘helpers’) could be really helpful – if there was an odd number of participants, one of the co-facilitators could participate rather than facilitate. Timing. Overall, I think the timing worked okay – we were finished (including wrap-up/debrief) in 90 minutes as planned. It definitely felt rushed at times (and the participants clearly felt uncomfortable about this), so I think it’s worth emphasising this up front and letting participants know in advance that the course is going to feel like this. Warm up. It took a while for participants to warm up and really get into the experience. I observed that the initial ‘interviews’ were quite formal, quiet, and there were a few uncertain faces. But as people moved further and deeper into the conversations and begun to get some clarity about possible ideas/solutions, the conversations became much more animated and enthusiastic. If I was running a session again with a group of participants that didn’t know each other that well I’d try to run a quick warm up activity once the pairs were established – something fun and quick to get participants thinking creatively and build some initial connection/trust/rapport. Instruction. Although the aim of the exercise is to redesign the experience of giving a gift, some of the participants still gravitated toward designing a better gift for their partner to give. This is probably in part because it feels easier to design and physically prototype a product rather than a service. Also, in the initial interview step participants are prompted to ask each other about the last time they gave a gift – so some of my participants focused on creating a better gift for that particular scenario. Next time, I’ll provide a more generic instruction to participants and perhaps encourage them to share a couple of experiences (the most recent gift giving experience, the most positive experience, a time when giving a gift was difficult or frustrating) rather than focusing only on the most recent experience. It’s also something to watch out for as a facilitator and keep reminding participants that they’re designing an experience rather than a gift. Pictures vs words. I work an environment where we use words a lot! Our communication is very focused on written emails, briefs, reports etc, or verbal reports/feedback given through meetings. Having to sketch ideas was certainly something that participants felt initially uncomfortable with. There were lots of ‘but I can’t draw’ comments and slightly frustrated faces. But as they got into the exercise and realised that they ‘had’ to draw, they seemed to embrace (or at least care less about) being a less than perfect artist! Focus on getting quantity quickly. Again, this was a difficult part of the exercise for many participants. Coming up with multiple crazy ideas is not something we do regularly, but having an imposed goal (‘you must come up with at least 5 ideas’) forced everyone to think a little broader (and perhaps a bit wilder) than they may have if they just had to come up with a single solution. Involving users early. If participants had been asked to redesign the gift giving experience for their partner without talking or interacting with their partner, then the results would have obviously been different (and probably vastly inferior). This exercise clearly demonstrates why it is essential to interact with the user early in the process and understand their needs and desires. You don’t need to be an experienced facilitator or have any fancy equipment to run this session. Thanks to the fact that the d.school has done most of the thinking/planning work up-front, it’s a quick, simple, and relatively inexpensive way to run a training session to introduce your colleagues to design thinking. Highly recommended! Thanks for sharing Clare. It is good to hear your experience. I am working on starting a group to undertake the virtual crash course together with the purpose of seeding a network with tools for change. What was the impact of the gift-giving project, in terms of a shift in participants thinking and behaviour? And, do you have any follow-ups planned as far as building a network or creating momentum for change? Dear Clare, Thanks for you inputs. I am trying to conduct a design workshop for students of MSSW and your inputs are really helpful.